From the indie game & art collective that brought you Diaries of a Spaceport Janitor comes a father-child adventure platformer unlike any other. 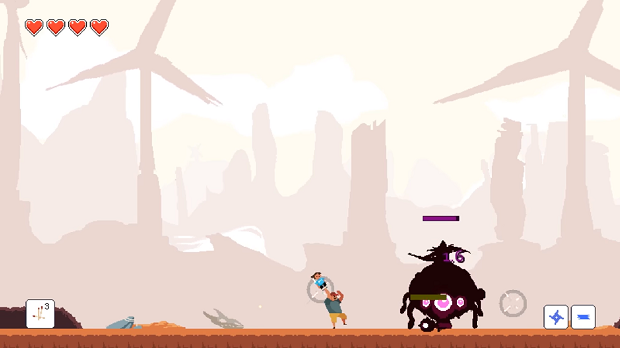 In Dad Quest you’ll use your kid as a weapon as you embark on a hilarious and epic journey. The Early Access version of the game includes a tutorial and half of the first chapter. You’ll get a peek at one of the game’s dungeons, some of the toys you can equip, and part of your child’s skill tree. The developers at Sundae Month chose to release Dad Quest through Early Access first for fresh input from players. They’d rather not let it remain in Early Access too long, but they anticipate that development will continue for at least another six months. Aside from fixing bugs and polishing the game, its time in Early Access will bring about new side quests, equips, and abilities influenced by the community. Be on the look out for this 2D platforming game on the Steam store. Dad Quest will be launched on Early Access on February 23, 2017 for $7.99.